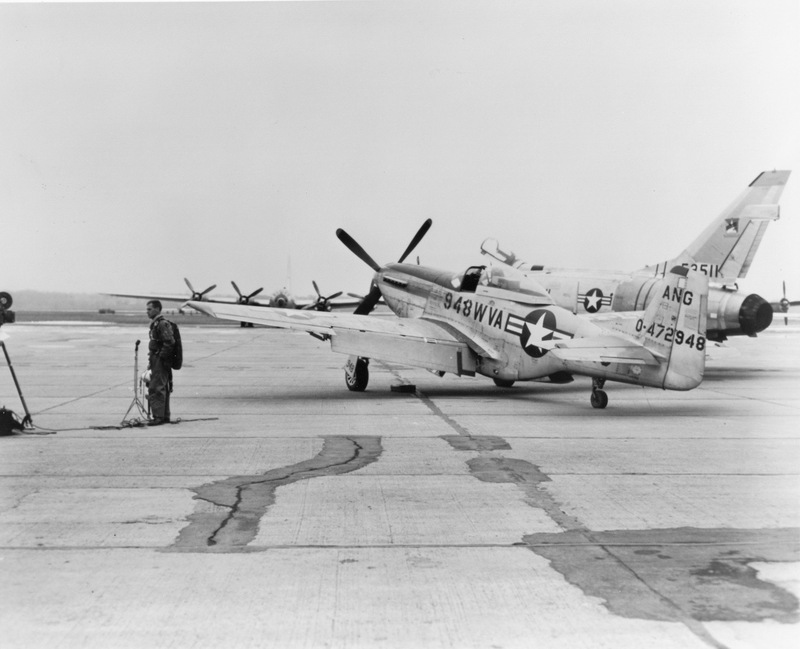 27 January 1957: The last North American Aviation F-51D Mustang fighters in operational service with the United States Air Force were retired from the 167th Fighter Bomber Squadron, West Virginia Air National Guard. The squadron was based at Shepherd Field, Martinsburg, West Virginia (now known as Eastern West Virginia Regional Airport, MRB). DAYTON, Ohio (UP)— An era in aviation has ended with the last official flight Sunday of a P51 Mustang fighter, pride of American’s [sic] World War II air arsenal. The flight made by a former Canadian Royal Air Force ace, Major James L. Miller in a P51D, also marked the end of propeller-driven fighter planes in the U.S. Air Force. Miller took off from nearby Wright Field at 1:30 p.m. Sunday and landed at Patterson Field several miles away 45 minutes later. Henceforth, the Air Force will use nothing but jet-powered fighters. 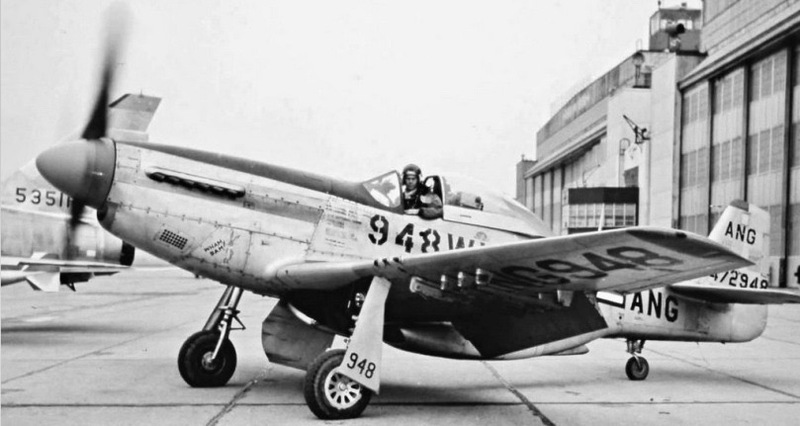 The ravages of age prevented a battle-worn Mustang from taking part in decommissioning ceremonies at Wright-Patterson Air Force Base, so a substitute flight had to be arranged. The Mustang grounded at Cheyenne, Wyo., for repairs, could not take off as scheduled Friday because of bad weather. The flight to Kansas City on Saturday and to Wright-Patterson on Sunday, had been scheduled for Lt. Col. Joseph T. Crane, commanding officer of the 167th Fighter-Interceptor Squadron [sic] of the West Virginia National Guard. A quick switch in plans followed, and the Air Force requisitioned the only other P51 available from an airport at Charleston, W. Va. The plane had been earmarked for a city park there. 44-72948 had just completed repairs at Cheyenne, Wyoming, and was returned to Charleston by the 167th’s commanding officer, Lieutenant Colonel Joseph T. Crane, Jr.
44-72948 (North American Aviation serial number 122-39407) had been delivered to the U.S. Army Air Corps at Mitchel Field, Long Island, New York, in February 1945, but with the war drawing to a close in Europe, the Mustang never flew in combat. According to contemporary newspaper reports, during its career -948 was assigned to sixteen different Air Corps/Air Force units. It underwent nine engine changes and flew a total of 1,555 hours during nearly 12 years of service. 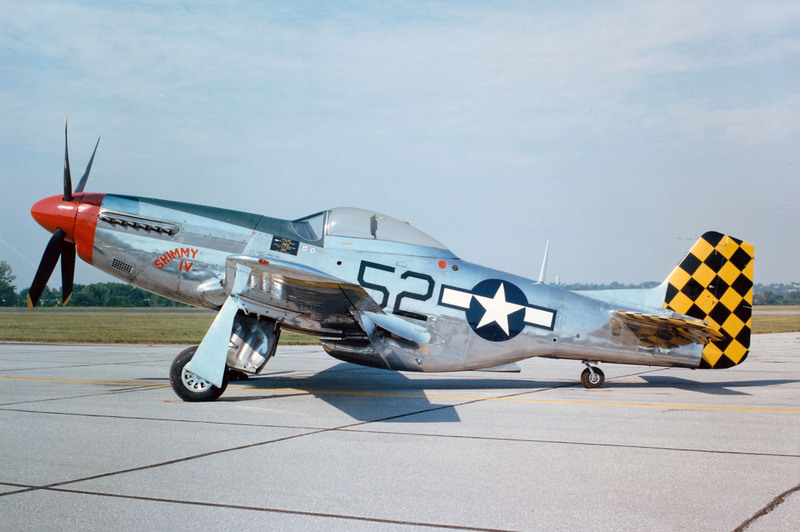 The airplane in the photographs below, North American Aviation F-51D-30-NA 44-74936, was was flown from Charleston to Wright-Patterson Air Force Base, Dayton, Ohio, by Major James Miller. It was transferred to the United States Air Force Museum (renamed National Museum of the United States Air Force in 2004) where it is on display. 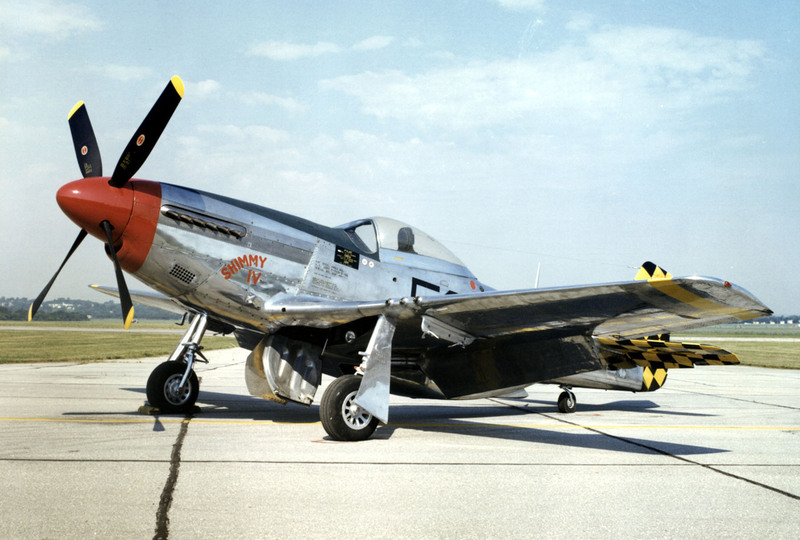 The fighter is painted with the markings of another Mustang, P-51D-15-NA, 44-15174, Shimmy IV, of the 325th Fighter Group, Fifteenth Air Force, which served in North Africa and Italy during World War II. On 2 June 1944, the actual Shimmy IV, flown by Colonel Chester L. Sluder, commanding officer of the 325th Fighter Group, led the fighter escorts for the first Fifteenth Air Force “shuttle bombing” mission to attack a railroad mashaling yard at Deprecan, Hungary, before flying on to land at Piriatyn, Ukraine. The name “Shimmy” was from the name of Colonel Sluder’s daughter, Shari, and the nickname of his wife, “Zimmy,” formerly Miss Louise Zimmerman. On 9 December 1944, 44-15174 was flown by Lieutenant Norval W. Weers, 318th Fighter Squadron, when it ran low on fuel because of adverse weather. Weers crash-landed south of the Neusiedler See, Austria. He was captured and held as a prisoner of war at Stalag Luft I. North American Aviation P-51D-5-NA 44-13366 on a test flight near the North American plant at Inglewood, California. The P-51D was the predominant version of the North American Aviation single-place, single-engine, fighter, The P-51D was 32 feet, 3.5 inches (9.843 meters) long, with a wingspan of 37 feet (11.278 meters). It was 13 feet, 4.5 inches (4.077 meters) high. The fighter had an empty weight of 7,635 pounds (3,463 kilograms) and a maximum takeoff weight of 12,100 pounds (5,489 kilograms). Like the P-51B and C variants, the P-51D was powered by a right-hand tractor, liquid-cooled, supercharged, 1,649-cubic-inch-displacement (27.04-liter) Packard V-1650-3 or -7 Merlin single overhead cam (SOHC) 60° V-12 engine which produced 1,380 horsepower at Sea Level, turning 3,000 r.p.m at 60 inches of manifold pressure (V-1650-3) or 1,490 horsepower at Sea Level, turning 3,000 r.p.m. at 61 inches of manifold pressure (V-1650-7). (Military Power rating, 15 minute limit.) These engines were versions of the Rolls-Royce Merlin 63 and 66, built under license by the Packard Motor Car Company of Detroit, Michigan. 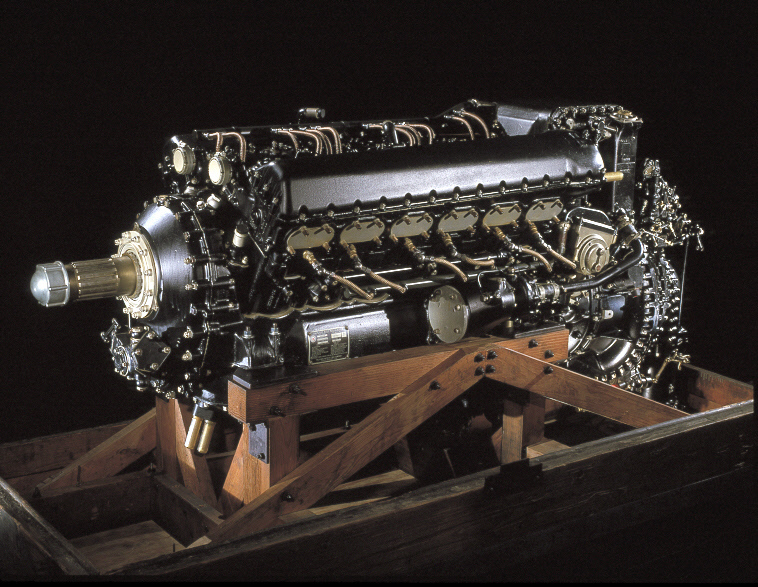 The engine drove a four-bladed Hamilton Standard Hydromatic constant-speed propeller with a diameter of 11 feet, 2 inches (3.404 meters) through a 0.479:1 gear reduction. The P-51D with a V-1650-7 Merlin had maximum speed at Sea Level of 323 miles per hour (520 kilometers per hour) at the Normal Power setting of 2,700 r.p.m. and 46 inches of manifold pressure, and 375 miles per hour (604 kilometers per hour) at War Emergency Power, 3,000 r.p.m with 67 inches of manifold pressure (5 minute limit). At altitude, using the Military Power setting of 3,000 r.p.m. and 61 inches of manifold pressure (15 minute limit), it had a maximum speed of 439 miles per hour (707 kilometers per hour) at 28,000 feet (8,534 meters). With War Emergency Power the P-51D could reach 442 miles per hour (711 kilometers per hour) at 26,000 feet (7,925 meters). The P-51D could climb to 20,000 feet (6,096 meters) in 6.4 minutes, and to its service ceiling, 41,600 feet (12,680 meters), in 28 minutes. The airplane’s absolute ceiling was 42,400 feet (12,924 meters). 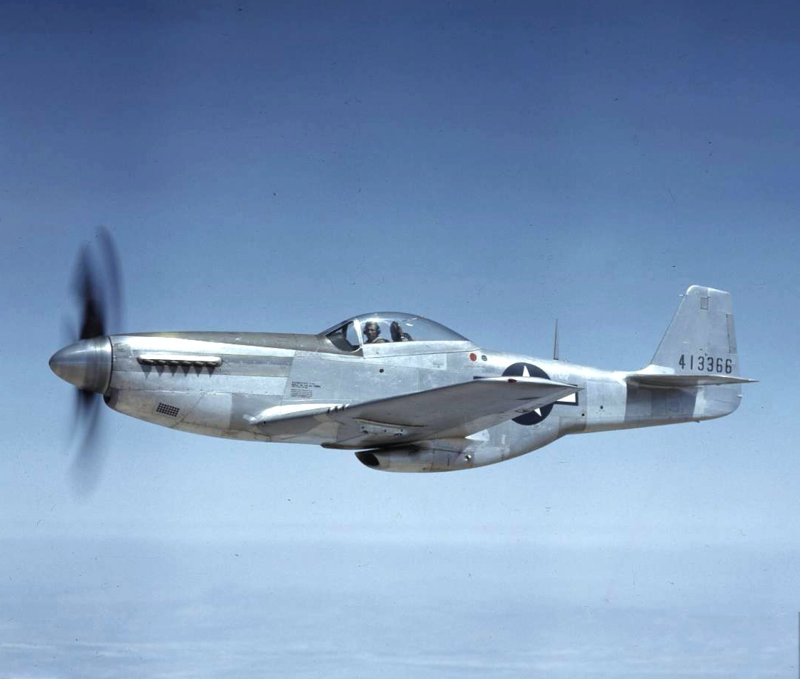 With 180 gallons (681 liters) internal fuel, the maximum range of the P-51D was 1,108 miles (1,783 kilometers). 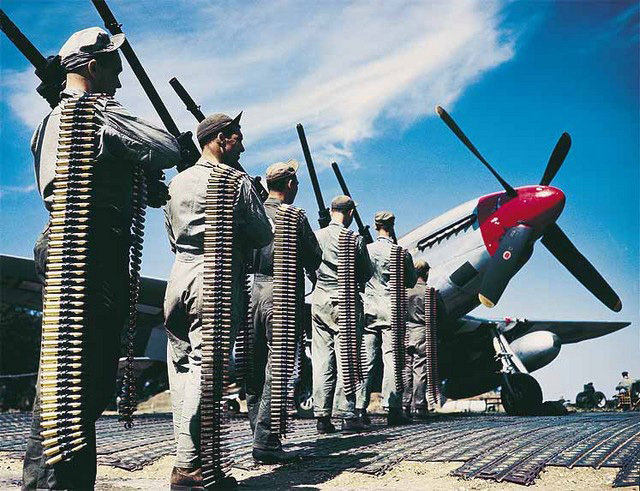 The P-51D was armed with six Browning AN-M2 .50-caliber machine guns, with three mounted in each wing. 400 rounds of ammunition were provided for the inner pair of guns, and 270 rounds for each of the outer two pairs of guns, for a total of 1,880 rounds. This was armor piercing, incendiary and tracer ammunition. The fighter could also carry a 1,000 pound (453.6 kilogram) bomb under each wing, in place of drop tanks, or up to ten rockets. North American Aviation, Inc., produced a total of total of 8,156 P-51D Mustangs at Inglewood, California and Dallas, Texas. Another 200 were built by the Commonwealth Aircraft Corporation in Australia.